Al Goshman, a highly skilled table magician whose performances were both entertaining and dexterous, began his career as a baker in a Brooklyn Bakery and was known to make great bagels. When he started to dabble in magic, he performed using the name “The Baker That’s a Faker” or “Fakir the Baker.“ During World War II, while working in a defense factory, he discovered a small magic book of coins and pocket tricks and he began to study them. After the war, Goshman began to haunt the many magic stores in New York City where he met up-and-coming magicians before relocating to California in the early 1960’s. By 1963, he had performed at the new famous Magic Castle in Hollywood and began making a name for himself as a close-up sleight-of-hand magician. Unlike many of today’s younger magicians who perform informally, Goshman began to create specific routines with his magic. Many of today’s aspiring magicians purchase the latest magic tricks advertised by magic dealers and end up with certain skills but fail to follow through by routining. These fellows usually perform a couple of tricks either in the bar or on the street, and seem to be more interested in ‘wowing’ the spectators than in building a proper act. Magic is not about self- aggrandisement but entertaining others. Goshman showed how important it was to build an act that had impact and continuity and still remained entertaining. Albert Goshman developed a number of clever effects always carefully routined and he was a master of misdirection and timing. He was almost in the same genre as Slydini was. Some of his notable routines were his Four Cards from Newspaper, Coins through Table, Card in Purse, Benson Bowls and Winged Silver. Probably his most remembered effect was Coin under the Salt Shakers. This was performed while seated and used clever sleight of hand, timing and audience participation. The coins would appear from a purse frame (the metal frame that fits around a small leather purse). He would also use the metal purse frame to produce sponge balls, cards or bills which always created some humour. Once the coins appeared, they would vanish and appear beneath a salt and pepper shaker, seemingly without Al touching the shakers. The routine involved the interaction of two spectator participants, with Goshman guiding and misleading them as only a good showman can. This particular routine became a trademark of Goshman magic. He was also adept at card magic and he was one of the few magicians who made use of the Nudist Deck and other trick decks. Part of his close-up presentation included his Rising Card where the chosen cards would rise mysteriously from the deck on command. On December 7th 1985, Al Goshman gave a special magic presentation at a secret London location hosted by Ron MacMillan who ran the International Magic Studio in London. The secret venue turned out to be the Kennedy Hotel and the event was attended by 200 magicians. It was by special invitation only and took the form of a lecture/demonstration. This remarkable event became famous for the content and sharing that Al Goshman presented during that night. The full lecture/demo originally recorded on video is still available on DVD from select dealers. 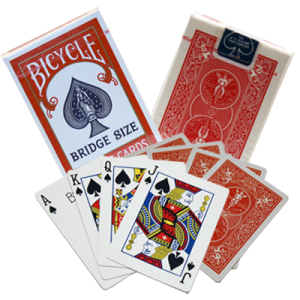 It became and remains one of the finest teaching tools available to magicians even today. Nick Lewin, a magician colleague of mine who was a former columnist for the IBM Linking Ring Journal and a busy professional American magician, relates a fascinating story about when he first met Al Goshman. Nick had just completed his performance at the Magic Castle when he ran into Goshman outside the Close-up Gallery. Nick performed the Ken Brookes Sponge Ball routine using Goshman Sponges he had purchased years before. Goshman stopped Nick and suggested he purchase a set of new sponges as they looked a bit grubby to place in a spectator’s hand. Nick is probably the only magician to have ever been chided by Al Goshman. Al Goshman’s magic was very different. It was smart, organised and very well-executed, but somehow Goshman always tended to look a little scruffily dressed. One evening he was booked to perform for an elite, upmarket group where the event planner wanted Al to look his very best. Al’s wife sent him off to the Castle in a spotless tuxedo and nice accessories including white cotton gloves. For once he looked smart and elegant just as his magic did that night in the Houdini Room where he wowed the crowd with a superb display of clever close-up that included his classic Coins under the Salt Shakers and Jumbo Coins. 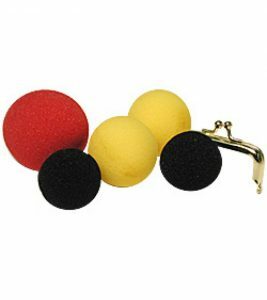 We are fortunate that Al Goshman developed and set up the manufacturing of beautiful synthetic sponge balls and sponge and foam products. These include such items as Multi-Coloured Balls, Ball to Square, Sponge Bunny, Clown Noses, Chick and Dove Pan Cakes, 3-D Sponge Rabbits, Coin Purses, Purse Frames, Multiplying Rabbits, Foam Dog Bone, Foam Brick, Foam Dove, Foam Eggs, a string of Foam Sausages and a realistic Foam Hotdog. All these products are made from high-quality, super soft sponge and the business is now operated by Goshman’s son Steve. During his lifetime, Albert Goshman was honoured with the first Association of Magical Arts Award for the Best Close-up Magician in 1968. 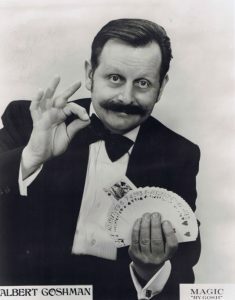 In 1975, he was awarded the AMA Award for Magician of the Year and Best Close-up Magician. He participated in many trade shows and was guest performer at Metro Goldwyn Mayer’s Samuel Goldwyn’s 84th birthday party. Much has been written about Al Goshman, including the wonderful book by Patrick Page titled Magic by Gosh. Gradually Goshman became ill but he continued to perform. He passed away in Los Angeles on February 12th 1991. He left us a wonderful legacy that is as as valid today as it was then, a real tribute to our wonderful world and history of magic. *Grateful thanks to Nick Lewin for providing extra information about Al Goshman at the Magic Castle.